Can Restaurant Insurance Restore Your Reputation in a Crisis? Reputation is the foundation of a restaurant. Lose your reputation and you lose the business. Tainted food can kill your reputation overnight, but that’s only one of the risks that can put a restaurant out of business. Whether it’s an armed robbery in the parking lot, a grease fire that gets out of hand, or a natural disaster that flattens the structure, your restaurant cannot escape the potential for a serious setback that puts the entire enterprise at risk. 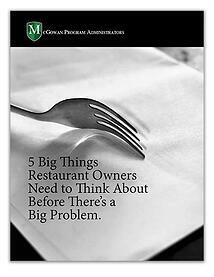 And restaurant owners need to think about more than just a possible crisis. How will you pay for crisis-management expertise to rescue your company’s reputation? Have you accounted for post-crisis expenses? How will you care for your stakeholders? Who will talk to the media to defuse the crisis? For quick answers, fill out the form and download our free guide: 5 Big Things Restaurant Owners Need to Think About Before There’s a Big Problem. Want to Learn More? Download Now!